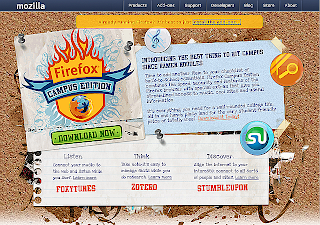 I was really excited when I learnt that there was a "Campus edition" of Firefox from one of my friends. BTW, would love to have a T-shirt with that flaming logo. FoxyTunes - lets you control almost any media player and find lyrics, covers, videos, bios and much more with a click right from your browser. StumbleUpon - lets you channel surf the Internet to find great websites, videos, photos and more based on your interests. Zotero - helps you collect, manage, and cite your research sources. It lives right where you do your work - in the web browser itself. Read the 10 reasons why Firefox is the best browser. Hahah! Very cool marketing idea. And the site looks absolutely amazing. Always fun to see what the boys over at mozilla are thinking about.